Since 1982, we have been guiding anglers and adventurers here, and we take pride in sharing the beauty and bounty of the magnificent Kenai Peninsula with you. Whether seasoned fly angler or first time spin fisherman, our variety of experience, volume of fish, comfortable accommodations, fine cuisine and available round-the-clock fishing is your assurance of an excellent fishing trip. With the combination of more than two dozen target fish species, 5 nearby rivers and 2 separate saltwater destinations, our Alaska Fishing variety is simply unmatched. 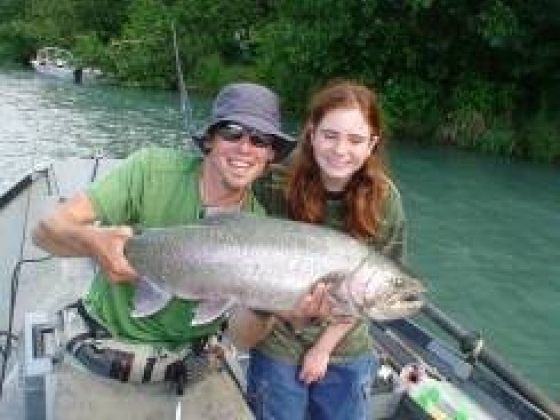 Kenai river king salmon, Kasilof river king Salmon, Kenai River sockeye salmon, Kenai river silver salmon and Kenai river pink salmon fill our rivers each season. 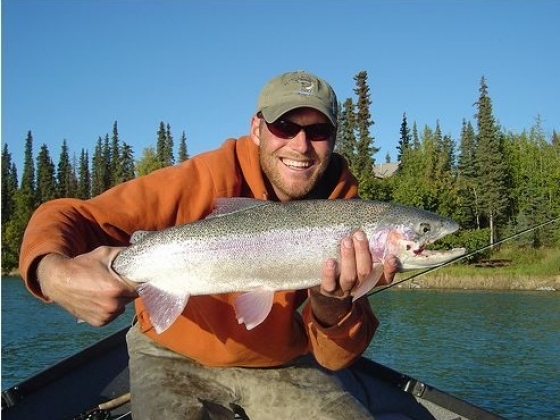 These 5 destinations include Kenai River fishing, Refuge waters, Kasilof River fishing, Wadefishing Rivers, and Kenai Peninsula Fly Out Fishing. Kenai Peninsula, Alaska, fishing lodge, salmon, rainbow trout, dolly varden, halibut, kenai peninsula, alaska, fishing lodge, salmon, rainbow trout, dolly varden, halibut, Salmon: The mighty King salmon first show up in the river in early to mid May, with the second (July) run finishing it's course after the King season has closed on July 31. Pink salmon readily take the fly, spinners, bait and nearly anything els an angler chooses to cast, and are the perfect target for family vacations, as everyone will have tired arms from releasing this aggressive and active species. Great Alaska's Two Offshore Locations Great Alaska has the good fortune of targeting Halibut, Cod and Salmon in two separate marine environments aboard our three boats - the Fair Chase, the Stellar and the Raptor. Halibut: Our Pacific Halibut reside in the deep, cold, nutrient-rich waters off the western and Eastern sides of the Kenai Peninsula. In mid May and June, we target them in on the West side, in Cook Inlet. Later, we add longer trips in Kenai Fjords National Park and target the Halibut and Silver Salmon in Prince William Sound’s beautiful waters. Cook Inlet Halibut We also fish for Halibut in the waters of Cook inlet in our smaller 24 foot open boat, "The Raptor". Shallower water, great average sizes and the ability to occasionally target returning king salmon make this one of our most popular fisheries in May and June, before the fish move too far offshore, generally in July and August. We fish the beautiful tidal waters of Cook Inlet for trophy Halibut from June through mid July. This is some of the best pure halibut fishing on the planet, with the famous "Tractor Launch" experience. Seward and Resurrection Bay Halibut fishing We also fish the gorgeous waters of Resurrection Bay and Prince William Sound aboard our custom offshore Glacier Craft, The Fair Chase. King, Silver and Pink salmon, numerous cod species (featuring Ling Cod) and of course some of the greatest Halibut fishing in the world, based out of the beautiful Seward Harbor. Trophy Kenai River Rainbow Trout Finally, our guests enjoy world renowned, trophy-class Rainbow Trout fishing on the mighty Kenai. Whether you're spin or fly fisherman, you'll experience some of the finest trout fishing on the planet. 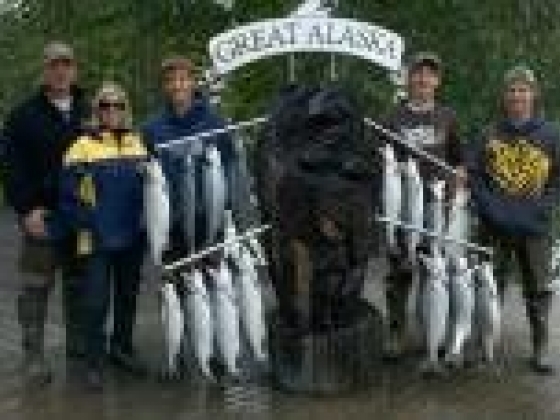 Alaska Spring Salmon/Halibut special A great trip if you are looking for King Salmon and offshore Halibut. Spring fishing is outstanding, with usually calm weather and long days to enjoy. 7 great days of fishing for the price of 5, or 5 days for the price of 4. Save up to $900.00 per person! Special available on trips booked in the 5/28 - 6/10 window. 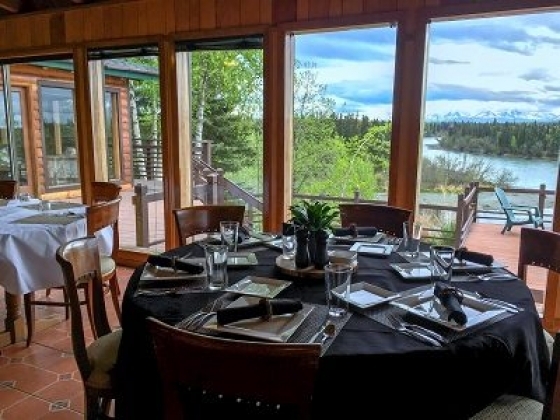 Trip includes: Complimentary P/U at your Anchorage hotel, plus all meals beginning with lunch on first day and ending with lunch on your final day. Return to Anchorage is not included. 175.00 per person for commuter air from Kenai. "Fall Splendor" Alaska Fall Fishing Special 5 big days of incredible fishing for the price of 4, or 7 big days for the price of 5!" Book your dates between Sept. 15-25. 5 days $2,795.00 per angler; 7 days $3,895.00 per angler. An amazing deal on one of our very best times. Choose from 5 or 7 Days of awesome guided fishing Pick dates that fall within the window and enjoy up to $900.00 worth of savings on the 7 day trip. Cast your fly or lures to Trophy Rainbow Trout and Char, plus beautiful Silver Salmon and tide-bright Steelhead. All meals, riverfront lodging and of course our "nearly world famous" nightly happy hour and evening activities. Trip must fall exactly into the above dates. Tax, license, gratuities and return to Anchorage extra. Special permits in the Kenai National Wildlife Refuge We are permitted to fish in the magnificent upper upper Kenai river, a drift only section of the river featuring gorgeous scenery and lots of bears! 3 day or longer trips can include a day of trophy trout fishing if you choose. Our 3 decades of local knowledge fishing and exploring the Kenai Peninsula, plus our top notch management & guide team, great itineraries, one of a kind location and bulletproof logistics are your assurance of a very special Alaska fishing trip.